Expedition 14 flight engineer Mikhail Tyurin hitting a lightweight golf ball as part of a publicity stunt for Canadian golf firm, Element 21. A Russian cosmonaut set a new record for the longest golf drive in history today after hitting a lightweight ball while tethered to the outside of the International Space Station (ISS). The golf shot was the first of several tasks performed by Expedition 14 commander Michael Lopez-Alegria and flight engineer Mikhail Tyurin as part of a busy spacewalk that got off to a late start. Fellow crewmate, European Space Agency astronaut Thomas Reiter, provided support from inside the ISS. Tyurin hit the 3 gram golf ball about 40 minutes into the spacewalk, using a gold-plated six-iron golf club. "There it goes!" Tyurin said after making the one-handed shot [image]. "It went pretty far. It was an excellent shot. I can still see it as a little dot that's moving away from us." The cosmic golf drive was part of a commercial agreement between the Russian Federal Space Agency and the Canadian golf firm, Element 21. For the stunt, a makeshift tee box was set up outside space station's Pirs docking compartment. During the shot, Lopez-Alegria held Tyurin's feet, which were affixed to a ladder. Tyurin carried three golf balls, but only had time to hit one of them before ground flight controllers instructed the spacewalkers to proceed to their other tasks. The golf ball did not travel in the full retrograde direction, away from the space station, as intended. Instead, Tyurin shanked the ball, causing it to fly past the starboard side of the Zvezda service module. NASA officials estimate the ball will travel about a million miles round the Earth before deorbiting and burning up in the planet's atmosphere in 2 to 3 days, thus posing no risk to the station or to a scheduled December shuttle mission. The previous record for an in-space golf shot was set by Al Shepard in 1971, when he hit a golf ball while on the surface of the Moon during Apollo 14. Shepard estimated that ball traveled 200 to 400 yards (183 to 366 meters). The longest recorded terrestrial golf drive is 515 yards (471 meters), and was set by golf pro Mike Austin in 1974. The spacewalk began more than hour late after Tyurin discovered that a kink in a hose on his Russian Orlan spacesuit was causing its cooling system to work only intermittently. The problem was eventually resolved and the spacewalk officially began at 7:17 p.m. EST (23:17 GMT), when the Pirs hatch was finally opened after some initial resistance. After the golf shot, the spacewalkers moved to the aft end of the Zvezda service module to examine a docking antenna that failed to retract during the docking of the Progress 23 service module with the space station in late October. After a visual inspection revealed the antenna was jammed against a handrail on the Zvezda module, the astronauts depressed a latch that should have enabled the antenna to be retracted. However, repeated attempts by the astronauts to manually retract the antenna failed, as did computer commands beamed up by Russian mission controllers. Time constraints forced the spacewalkers to move on to other tasks, but not before they took about 35 digital photographs of the balky antenna for engineers on Earth to analyze. "There isn't much else we can do with it," a Russian ground controller said. Next up for the spacewalkers was the unbolting and repositioning of a navigation antenna blocking the cover of a station reboost engine, a task that went off without a hitch. The antenna will be important for guiding unmanned European cargo ships to the Zvezda docking port next year. The initial delay caused by problems with Tyurin's spacesuit forced Russian ground controllers to dock one hour from overall time allotted for the spacewalk, since valuable lithium-hydroxide had been used up to scrub carbon dioxide from the suits. As a result, the spacewalkers were pressed for time when entering into their final task: the attachment of a BTN Neutron solar flare experiment [image] on Zvezda's forward section of the Zvezda. 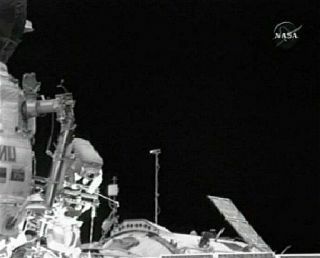 The 5 hour and 38 minute spacewalk was the sixth for Lopez-Alegria and the fourth for Tyurin. It was the 73rd EVA-or extravehicular activity-out of the ISS and the first of four spacewalks planned for Expedition 14 crewmembers.